Despite higher U.S. labor costs compared with Asia, a research firm says the Moto X is about 5 percent cheaper to make than Samsung's flagship Galaxy S4 phone. NEW YORK — Motorola’s new Moto X phone doesn’t cost more to make simply because it’s assembled in Texas, research firm IHS said Wednesday. The Moto X is the first smartphone to carry the “Made in the U.S.A.” designation. Labor costs are higher in the U.S. compared with Asian factories, where phones are typically made. But IHS said the Moto X is about 5 percent cheaper to make than Samsung Electronic Co.’s flagship Galaxy S4 phone. The firm said the Moto X’s overall production cost is just 9 percent more than that of Apple’s iPhone 5. The findings come as little surprise, as the labor cost of a phone is just a small part of its production cost. IHS estimates that labor and other assembly costs Motorola $12 per phone for the Moto X, bringing the production cost to $226. That compares with $207 for the iPhone 5 and $237 for the Galaxy S4. IHS said Motorola is able to keep the cost of parts low by using standard components that don’t break much new ground. By assembling the phone in Fort Worth, Texas, Motorola is able to let customers order custom designs online for delivery within four days. Standard black or white models are available immediately at retail stores. “With the Moto X, Motorola is reaping the public-relations and customization upsides of producing a smartphone in the United States, while maintaining competitive hardware costs,” said Andrew Rassweiler, senior director for cost benchmarking services at IHS. IHS said the estimated $12 for assembly is about $3.50 to $4 more than other leading phones. 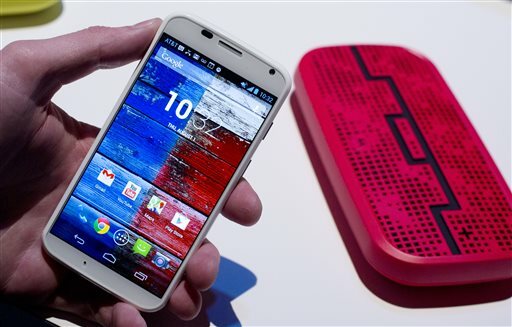 “Our initial estimate suggests the additional costs of onshoring the Moto X are relatively low,” IHS said. The phone went on sale last Friday, starting with AT&T. It’s coming to other carriers, including Verizon this week. The Moto X’s price is about $200 with a two-year service agreement. The Moto X is Motorola’s first phone designed from the start under its new owner, Google Inc. The Internet search company bought Motorola Mobility for $12.4 billion last year.